From the Collection: What’s in YOUR pockets? Have you ever pulled out your heavy coat for the first time in the winter season, stuck your hand in your pocket and found a movie stub from a year ago? I love those moments. This tiny object transports your mind back to a memory when you were laughing, crying, or simply just enjoying being with your family or friends. Well, as we have been going through the collection getting ready for the move to the new museum, I have had quite a few moments like that…only they’re not my memories, they’re someone else’s — and they’re over fifty years old. Out of the pockets of several dresses, jackets, and pants I have found all sorts of objects left behind. Questions going whizzing by: who was this person? What meaning did these objects have to him or her? Where did they come from? The first set of objects I found sent all sorts of scenarios through my head. 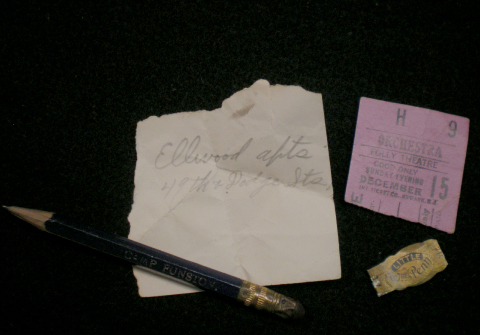 In the pocket of an old WWII uniform there was a ticket to see an orchestra, an address written on a small piece of paper, a pencil with the words “Camp Funston,” and a cigar band. Perhaps, this man had a blind date that he took to the orchestra and who lived at the address on the paper. Was Camp Funston where he was stationed? Were “Little William Penn” cigars his favorite? 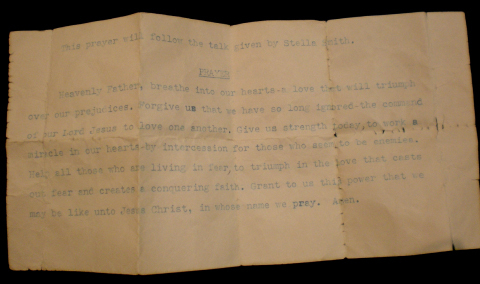 In another WWII uniform I found a typewritten prayer. Did this man ever see battle? What was life like back then when you could be sent to war at any moment? Some other fun finds from military uniforms were two tiny cloth sacks filled with tobacco and a penny with the wheat design on the back. The cloth sacks were really just a square piece of fabric gathered together and tied with a long piece of fabric. How things have changed over time, huh? 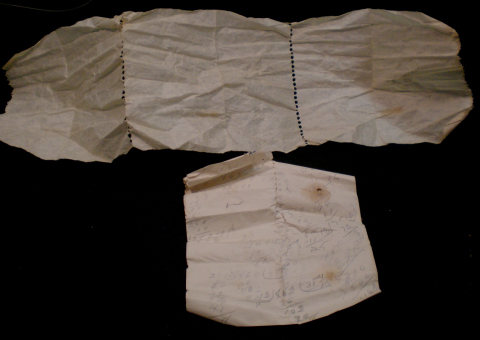 The last things that I found in pockets were crumpled up pieces of paper in a woman’s dress. Doesn’t one look like toilet paper? Yet it feels like normal writing paper. The other one is filled with math problems. So much for those snazzy cell phones with calculators on them! Mystery cracked: Only a shell of what it once was! When I started researching the Berry Egg collection several weeks ago, I never imagined what kind of tantalizing information I would uncover. One source led me to another source, and to another, and so on. There were so many questions I had wanted to answer! The first one that I set out to find was how Mr. Berry had made such perfect and tiny holes in the small and delicate eggs to extract its contents. And for that matter, how did he do it with just one hole? Growing up, whenever I blew eggs for Easter I would make a small hole in the top and in the bottom and blow in one hole for the contents to escape out of the other one. It not only led to two holes, but my holes were also jagged and sometimes cracked the egg. So how, then, did John Berry create such a perfect little hole? Well, after reading about the practices of Ornithologists (who study birds) and Oologists (who study bird eggs) I found that even back in the late 1880s, oologists had started perfecting their techniques for preserving bird eggs. It involved a set of very small drills and a blowpipe. To prepare an egg, one would start with a very small needle to pierce the shell. Once that was completed, the drills would be used to make the perfectly cut holes in each of the eggs. Finally, a very small pipe was used to blow air into the hole causing the contents to bubble out and around where the air was coming in. Accomplishing this task successfully meant that only one hole in each egg would need to drilled. So, of course, finally answering this question means that a little experimentation needs to be done! I fully intend to test this out on an egg from the grocery store, and invite others to try it as well! For my blowpipe, I figured I would use one of those coffee stir sticks that are essentially extremely small straws and see if I can make a hole as small as Mr. Berry’s ones. The next questions I wanted to answer were just who exactly was John T. Berry , and why did he collect nearly 500 eggs? A trip into the Local History Archive revealed that we had a vertical file on John and his wife with newspaper articles and a transcript of an oral history from his step-daughter. Turns out, Mr. Berry was a stone worker in Stout, the town that in now buried under Horsetooth reservoir. He owned a farm right outside Spring Canyon, which was the main entrance from Fort Collins to Stout that was filled in when they made the reservoir. This information only led to more questions, however. If he was a stone worker in Stout, why did he have a collection card from the Colorado Agricultural College? More digging finally brought the answer — W.L. Burnett. Mr. Burnett wrote an article in 1915 discussing how he was in debt to Mr. Berry for helping him collect information on the local birds. Apparently, Mr. Berry’s farm was a favorite place for birds to stop and nest. At the very end of the article, after a list of birds they had found, many of which are the ones now in our collection, was the words “Colorado Agricultural College.” There it was! Mr. Berry’s connection to the college and where the note card came from. William L. Burnett had worked in the Entomology and Zoology department of the college as the Deputy State Entomologist and Museum Curator. With the help of John Berry, Burnett was able to discover and record bird species that were not yet known in Larimer County and Colorado. He reported many of his findings to the Cooper Ornithological Society, who in turn, published them in their magazine, The Condor. So as it all works out, John T. Berry wasn’t just some man who collected bird eggs as a hobby, he was also indirectly responsible for expanding the field of ornithology in Colorado. What an exciting find! In the world of museum collections, we sometimes make new and exciting discoveries without collecting anything new and exciting; this is a story of one of those times. Right now those of us working with the artifact collections at the Fort Collins Museum & Discovery Science Center are preparing for the Museum’s future move to a new building by making inventories of all our existing collections; emptying cabinets, pulling artifacts out of storage, researching their records — trying to make sense of what we have and what it’s going to take to get it from the Museum’s old home to its new one. Mostly, we are working with artifacts that are familiar to us: we’ve featured them in exhibits, or they’ve been requested by researchers and students. But among the 35,000 or so objects in the Museum’s collection some are bound to find themselves into the darker recesses of cabinets and shelves, where no one working at the Museum today has ever seen them — until now. While some of these hidden objects are curious, and some are baffling, we are discovering some true treasures too. Recently we pulled a wooden box none of us had ever noticed before off the back of a top shelf. It was so light that climbing off the step ladder with it I thought it must be empty. But opening its hinged lid revealed, nestled in fluffy (and slightly stinky) wool, literally hundreds of bird eggs. Each egg had been pierced with one tiny hole to extract their contents, and many bore a number in red ink. The variety in their colors and shapes was dazzling: speckled pinks, blues, browns; vivid smooth blues and glossy greens; roundish ones no bigger than the tip of a pinkie finger, and much larger conical ones. Papers included in the box identified the collection as the work of John T. Berry, of the Colorado Agricultural College (which eventually evolved into Colorado State University). According to these records Berry collected the eggs throughout Larimer County in 1904; his daughter Lottie donated them to the Fort Collins Museum in 1959. A numbered list of bird species seemed to correlate with the numbers on the eggs. Included in these papers was one tantalizing note card which Berry filled with information about one particular set of eggs: it notes the date and weather when he gathered the eggs, the placement of the nest, the presence and behavior of the bereaved parent bird (equally troubling to my non-scientist’s heart and my contemporary conservationist’s mind), and the number of eggs in the clutch. As a curator I could easily appreciate the immense historic value of this collection. In collecting these eggs John Berry had literally scooped up a chunk of the our local environment in 1904 and put it in a wooden “fancy peppers” box, where it had remained preserved for over a hundred years. I knew the collection must have a scientific value as well. What bird species are represented in this collection, for example, and in what numbers? Certainly some of them must have become rarer or even disappeared in the years since Berry amassed his collection. It took a short afternoon looking through the information available on the use of historic egg collections like this one for me to start to appreciate the huge scientific value of this treasure. While debate apparently continues on whether or not egg collecting should continue today — whether or not the conservation value of the information to be gained justifies the negative impact of collecting eggs on contemporary bird numbers — there is no disagreement within the scientific community on the research value contained in historic egg collections. Much like contemporary archaeologists are increasingly turning their attentions to existing cultural collections in lieu of excavating dwindling cultural sites, many contemporary bird researchers are turning to existing bird skin and egg collections rather than gathering specimens of dwindling species. In addition to their importance for basic reference purposes, egg collections serve as valuable tools in areas such as ecology, physiology, zoogeography, and pollution studies. Historic assemblages of eggs offer researchers opportunities to study long-term changes which may have occurred in many aspects of the local environment: changes in the climate, the birds’ food base, and the presence and effects of pollutants. It was exciting to me to learn that research on museum egg collections was instrumental in establishing a conclusive link between the widespread use of the pesticide DDT and eggshell thinning in raptor species; establishing this link led to the eventual ban of DDT use in many countries, including the U.S. It turns out that even the seeming neglect of Berry’s eggs within the Museum’s collection, their years spent at the back of a shelf in the dark, has some scientific merit. Egg collections that have been on display for long periods lose much of their research value because of damage resulting from exposure to light and dust — damage that is particularly relevant to DNA studies. Also, recent advances in sampling techniques and analysis methods used on egg specimens require smaller sample amounts, and employ less destructive means that research techniques of past decades. Should we allow a researcher to gather samples from this collection, this work will be done today with far less impact than it would have required back when the Museum first acquired the collection. Our beautiful box of eggs clearly contains more questions than answers right now. Ashley Houston, one of the Museum’s new Collections Specialists, is still carefully going through the box, sorting, cleaning, and counting the eggs. How many will there be, of how many different kinds? We’ve contacted CSU in hopes of tracking down Professor Berry’s field notes. Will we find information that correlates with the numbers placed on the eggs in spidery handwriting? What will we discover about John Berry, his life, and his work with birds in Larimer County? What could we potentially learn about the changes that have occurred here in the 105 years since he collected these eggs? Keep in touch, and as soon as we answer any of these questions we’ll let you know.